Apara Ekadashi is a fasting day for Hindus that is observed on the ‘ekadashi’ (11th day) of the Krishna Paksha (the dark fortnight of moon) in the Hindu month of ‘Jyeshtha’. It is believed that by observing Apara Ekadashi vrat all the sins of the person will be washed away. 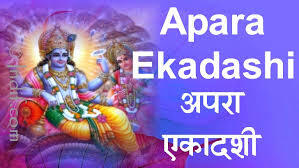 This ekadashi is also popular by the name of ‘Achla Ekadashi’ and gives divine and auspicious results.